NEW YORK (AP) — "Game of Thrones" fans, get ready. Sophie Turner was a "troublemaker" when she was 18. The 22-year-old actress - who is engaged to Joe Jonas - insists she is more of a "mediator" these days, but tries not to get involved in situations involving people she cares about. Asked about her new movie 'Josie', and whether she identifies more with her character's troublemaking or mediating sides, she said: "I think I used to be one that would stir up trouble. Now, I don't think I'm that so much; I'm more of a mediator. Tye Sheridan has teased 'X-Men: Dark Phoenix' is more like a drama than a superhero film. 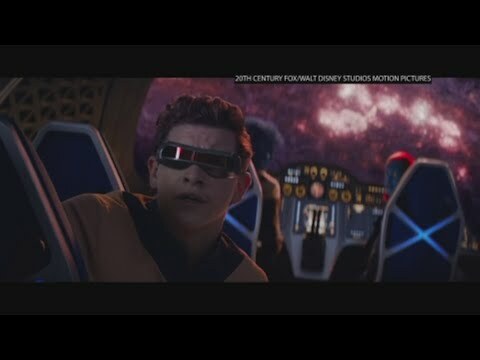 The 21-year-old actor stars as a young Scott Summers aka Cyclops in the 'X-Men' franchise and in the upcoming movie - which focuses of Sophie Turner's alter-ego Jean Grey aka Phoenix - Sheridan said her character "goes crazy". In an interview with The Wrap, Sheridan said: "Jean goes crazy in the movie. "Well, Cyclops doesn't think she's going crazy - Cyclops just thinks she's gotta work some stuff out. Maisie Williams has revealed she will be a bridesmaid when her best friend Sophie Turner marries Joe Jonas. The 20-year-old actress formed a close bond with Sophie after the pair first began starring as sisters Arya and Sansa Stark in HBO fantasy drama 'Game of Thrones', and has admitted that their close bond has even bagged her a role in Sophie's impending wedding. CLEVELAND, Ohio -- "Game of Thrones" fans: wondering if Westeros will survive the upcoming war with the White Walkers (who now have an ice dragon at their disposal! ), or how Jon Snow will react when he finds out his queen and new lover, Daenerys, is actually his aunt? Let's just say it's going to be awhile before you get any answers to those questions, HBO confirmed Thursday. Sophie Turner said being in 'Game of Thrones' is both a "blessing and a curse". The 21-year-old actress has portrayed Sansa Stark in the hit HBO show since season one and is currently filming for the eighth and final season, and the popularity of the show attracted a number of great actors including Peter Dinklage and Lena Headey. Maisie Williams is expecting to be Sophie Turner's Maid of Honor when she marries Joe Jonas. The 20-year-old actress and her 'Game of Thrones' co-star Sophie, 21, are very close friends and now she is getting married following Joe's proposal Maisise is hoping to get given the prominent role at their wedding. Sophie Turner and Maisie Williams have got matching tattoos. The 21-year-old actress and her 20-year-old 'Game Of Thrones' co-star decided to get the date they secured their role as Sansa and Arya Stark in the popular fantasy series inked on them. Speaking to Elle magazine about the inking, the 'X-Men: Apocalypse' star said: "We do! We always said that we wanted them so we got the date 07.08.09 on our arms because that's the date that both of us found out we'd got our roles in 'Game Of Thrones'." Demi Lovato is "so happy" for her ex-boyfriend Joe Jonas and Sophie Turner following their engagement. The 'Sorry Not Sorry' hitmaker briefly dated the 28-year-old singer in 2010 but there is clearly no bad blood between them as she jumped to congratulate the hunk when he announced on Instagram he'd popped the question to the 'Game of Thrones' actress after less than a year of dating. Singer Joe Jonas is engaged to "Game of Thrones" star Sophie Turner. Turner and Jonas shared the same photo on Instagram on Sunday of her hand sporting a diamond ring and resting on top of his. Turner noted in her caption that she "said yes." Joe Jonas and Sophie Turner are engaged. The Jonas Brothers star took to Instagram on Sunday (15.10.17) to announce he had proposed to the 'Game Of Thrones' actress - and she had said yes. Captioning a picture of their interlinked hands with Sophie showing off her wedding ring, he simply wrote: "She said yes." Sophie Turner has adopted another husky puppy. The 21-year-old actress - who stars as Sansa Stark in the hit HBO show 'Game of Thrones' - posted pictures of the tiny Siberian Husky puppy onto her Instagram account over the weekend, and suggested she's sharing the pooch with her boyfriend Joe Jonas as she also tagged him into the photos. She wrote: "Meet the newest addition to the krew @porkybasquiat. (sic)." Sophie Turner and Maisie Williams "f**ked" up lines while filming their long-awaited 'Game of Thrones' reunion. Sophie Turner thinks she owes much of her career success to her social media following. The flame-haired beauty - who starred in 'X-Men: Apocalypse' in 2016 - has claimed that her 5.4 million followers on Instagram often help her to secure coveted on-screen roles. She confessed: "A lot of what I have achieved is about timing and luck, but it is also, and I hate to say it, about a big social media following." 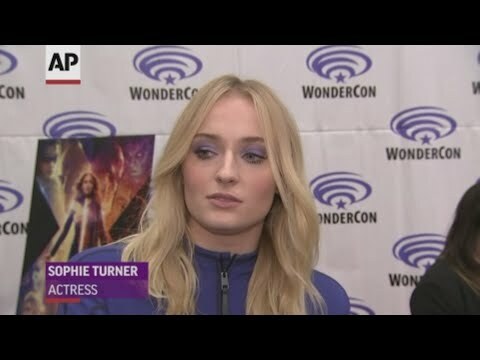 Sophie Turner has learned to "keep [her] mouth shut". 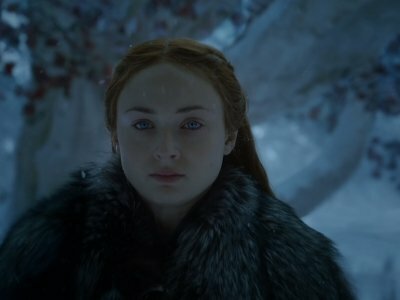 The 21-year-old actress shot to fame at the age of just 15 playing Sansa Stark in 'Game of Thrones' and she initially struggled to adapt to life in the public eye, so tried to carry on her life as normal, much to the despair of her "team", who worried about her social media outbursts. She said: "It was so gradual that I still treated my life and my social media like I wasn't in the public eye. Sophie Turner "accidentally" ruined Ed Sheeran's surprise appearance on 'Game of Thrones' by telling her co-star Maisie Williams. The 26-year-old 'Castle on the Hill' hitmaker had a cameo in the first episode of season seven of the HBO fantasy drama after he was brought on board to surprise 20-year-old Maisie - who plays Arya Stark - who is a fan of the flame-haired star. SAN DIEGO (AP) — Sansa Stark is woke now, Alfie Allen has a cute dog and everyone got sick of answering all those questions about whether Jon Snow was dead or alive, but little else was revealed at the annual "Game of Thrones" panel at San Diego Comic-Con on Friday. Sophie Turner admits it was "tricky" to grow up in the spotlight. The 21-year-old actress shot to fame when she was cast as 'Game of Thrones' Sansa Stark when she was just 12 years old and found it hard to battle with puberty and changes to her hormones while leading her life in public. She told People magazine: "That's definitely been tricky to deal with -- you're growing up, and hormones and puberty and everything's kind of hitting you all at once." When last we saw Petyr Baelish (Aidan Gillen), the cunning character known to many as Littlefinger on “Game of Thrones,” he was planning to sow discord between the recently reunited Sansa Stark (Sophie Turner) and Jon Snow (Kit Harington). Kit Harington enjoyed "not grunting" in the new series of 'Game of Thrones'. The 30-year-old star's alter ego Jon Snow departed his life as Commander of the Night's Watch and, after teaming up with sister Sansa Stark (Sophie Turner), reclaimed Winterfell and was proclaimed King in the North and the hunky actor is enjoying the newfound confidence of his character in the upcoming season seven. Sophie Turner finds dating Joe Jonas can be "frustrating". The 'Game of Thrones' actress began dating the 27-year-old singer last year and though they are "very happy" together, she hates the constant scrutiny they are under. She said: "You do feel like you're living in a fishbowl. It's frustrating [that] it's the most mundane things that make the news - how boring!" Sophie Turner finds it "easy" dating Joe Jonas. The 'Game of Thrones' star and the 27-year-old DNCE frontman have been in a relationship since late last year, and the flame-haired beauty has said she finds it simple to date the star as he already has an understanding of fame and doesn't overreact when her professional life gets in the way of their romance. GAME OF SPINOFFS: A particularly geeky highlight of the South by Southwest Conference and Festivals in Austin was when “Game of Thrones” showrunners David Benioff and D.B. Weiss took the stage to chat about their HBO hit. Joe Jonas tries "not to obsess" over rumors about his ex-girlfriends. The DNCE frontman, who is currently dating 'Game of Thrones' actress Sophie Turner and previously romanced Ashley Greene, Demi Lovato and Gigi Hadid, still finds it strange that people are interested in his personal life. LONDON (AP) — The perky, pastel-hued jazz musical "La La Land" quick-stepped into an awards-season lead Tuesday, gaining 11 nominations for the British Academy Film Awards , the U.K. equivalent of the Oscars. PARIS (AP) — The Louis Vuitton red carpet was rolled out at the historic Place Vendome on Wednesday for a much-needed happy ending to a Paris Fashion Week marred by the multimillion-dollar heist of Kim Kardashian West's jewelry. A roll call of actresses that included Alicia Vikander, Jennifer Connelly, Michelle Williams, Sophie Turner and a heavily pregnant Lea Seydoux joined tennis star Roger Federer in the front row. SAN DIEGO (AP) — Jon Snow isn't dead, but he is missing — at least from Comic-Con. The cast of "Game of Thrones" gathered Friday at the annual fan convention, minus a few key figures including Snow actor Kit Harrington, George R. R. Martin and Emilia Clarke. Those present included co-creators David Benioff and D.B. Weiss, actress Sophie Turner and others.